Lawrence, Kansas, March 22, 2019- Rock N’ Roll trio Goodbye June returned to The Granada Theatre. 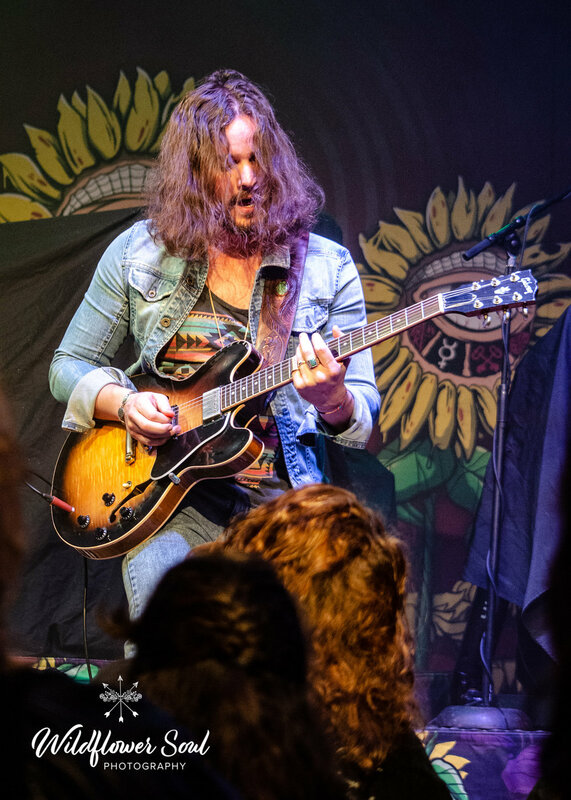 The band last played at The Granada on April 6, 2017 in an opening support role for the southern rock band, Whiskey Myers. The band this time was in a main supporting act role in between opener Dirty Honey and the headliner, Red Sun Rising. While the other acts on this bill were fantastic, Goodbye June stole the show. I was ecstatic to have had the opportunity to witness an absolutely breathtaking set and capture some of the moments with my camera. This is Goodbye June. Growing up on the songs of the gospel. That’s how many musicians start to learn their craft in the beginning stages of their musical journey. 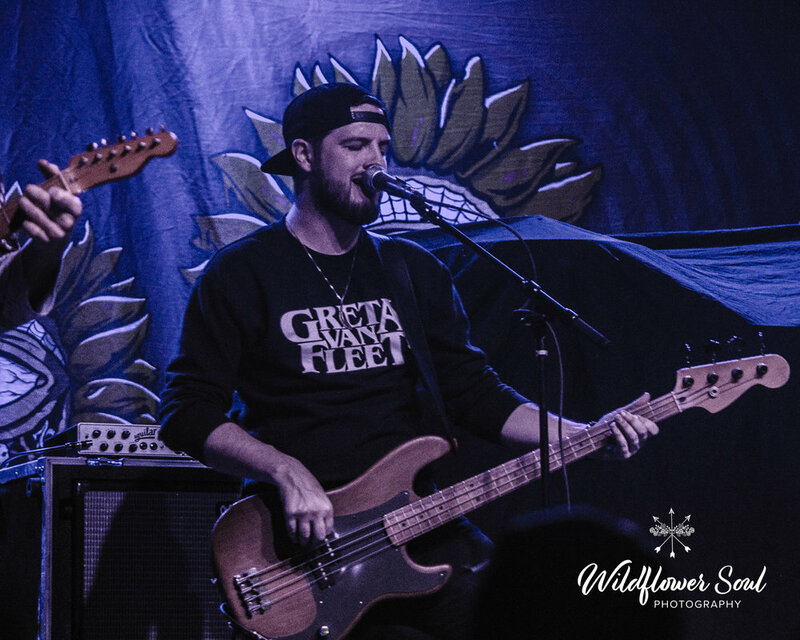 No different for the cousins that make up the trio Goodbye June with Landon Milbourn on vocals, Brandon Qualkenbush on rhythm guitar, and Tyler Baker on the lead guitar. The trio would expand to include Kevin Smith on the drums and Tim Braisted on the bass guitar to round out the current touring lineup. The band’s name is a tribute to the brother of Tyler Baker, Private First Class David Shane Baker, who passed away in the month of June. The band’s live show consists of the high energy that you would come to expect from a rock n’ roll act. But, the edge seems more authentic and down to earth. The sound generated from the instruments and the lyrics can be felt within. Whether you are one of their loyal followers, or a potential new fan, Goodbye June will leave you with a sense of fulfillment, but yet a need to seek out more. Luckily, I was invited to photograph them again the next night in Lincoln, Nebraska and once again I was awe struck by the amount of talent that was performing on the stage in front of me. On October 26, 2018, the band released their second EP, Secrets In The Sunset, via Suretone Records/Cotton Valley Music. The album is “An avalanche of rip-roaring rock ‘n’ roll, Southern-fried blues, and gospel soul, the group traverse their own lane at full speed.” The EP is a follow up to the band’s full-length album, Magic Valley, from 2017, which is available and a must listen on all platforms via Cotton Valley Music/Interscope Records. Secrets In The Sunset was produced by Bobby Huff and recorded at Black River Studios. The band’s goal was to produce an album that doesn’t sound like anything else. “That’s our goal when we sit down to write. We promise that’s never going to change. All our favorite bands made us feel something. We hope you walk away with a similar experience.” The five song EP accomplishes just that. You hear music that is not tailored or chopped up just for the purpose of radio play. Goodbye June stayed true to themselves and to their fans with this brilliantly written and mastered production. The live versions at the Granada of the title track, “Secrets in the Sunset,” “Live in the Now,” and “Get Happy” were equally phenomenal. Go give this EP a good listen and look out for these fellas on the road at a venue near you!